All You Need to Test Your Soil Nutrients in One Case. Get colorful results in minutes with just one soil extraction. These simplified methods for determining soil nutrients are perfect for introductory environmental science classes. The strong yet lightweight carrying case with secure foam inserts is portable from lab to field. Tests include humus, nitrogen, phosphorus, and potassium, as well as pH with enough materials for 50 tests each (100 tests for pH). 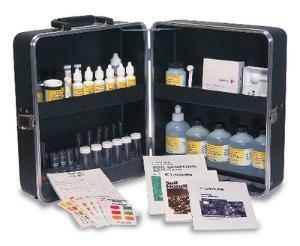 Reagents, glassware, laminated color charts, and instructions are included. Size: 14"L x 12"W x 7"H. Weight: 9 lbs. Ordering information: The refill kit includes 50 tests for nitrogen, phosphorus, potassium, and humus, and 100 tests for pH.